The Pawn system. Easily, the most unique element of the game. At the start of the the game, you create your main Pawn in the same way you create your own character (even choosing the face, hairstyle, etc). You also give your pawn a class. It’s best to create a pawn that occupies a class you think you’re least likely to use. If you normally like to beat the snot out of enemies with a two-handed sword, then create a Mage or a Strider (ranger), and if you normally like being a squishy mage, then create a Warrior to be your tank. This pawn remains with you for the entire game (you even name it), and cannot die permanently. You set your Pawn tendencies to dictate how you want it to behave in battle. These are more like general inclinations, rather than in-depth battle tactics like the ones found in Dragon Age: Origins. What makes the pawn system even more unique is that your created pawn is registered online through a place called the Rift. The rift is a kind of ethereal-looking place you enter through riftstones, and browse the pawns other people have created in their games. All their skills, stats and gear accompanies them. You can hire up to two more of these pawns to accompany you. If they are your level, they are free. If they are higher level than you, it costs money to hire them (the exception to this is, if a higher level pawn belongs to someone on your FL, it costs nothing – many people who play this game put other people on their FL just for this reason). When you dismiss the pawn later, you must give it a gift in the form of weapons, rings, or other gear. This gift remains with the pawn the next time its owner goes online. So if you keep a pawn stocked with good gear, and upgrade it with awesome skills, it will get hired more. It’s a little strange when you go into places where Pawns gather, since walking up and talking to them sort of feels like you’re in a 70’s swingers party. They kind of greet you with this sultry “hello” and then wait to see if you’re interested. Pawns can be found in places outside the Rift, like in cities or encampments. My only beef with the Pawns is that they never shut up. Their purpose, in addition to giving support in battle, is to suggest tactics and comment on options. Three of them all nattering away gets a little annoying at times, but its a minor thing. Aside from the pawn system, the game plays like a lot of other RPG’s. The combat tends to be faster than Skyrim, but much more polished. You are able to lock-on to targets when fighting, and can grapple things as well. I had one of my biggest LOL moments, one that actually brought me to tears, when I accidentally grabbed a boar, then hit a button to “throw” it. One of my pawns caught it, and tossed it to another pawn, who did the same. This went on for a few tosses, and looked like a game of hot-potato fused with a rugby match. If you ever try the game, I recommend boar-tossing. Boss fights also take a unique approach. If you play as anything melee based, your strategy in boss fights actually incorporates a bit of platforming as you grapple the boss and begin climbing it’s body, looking for weak spots. This can burn stamina. I have to admit, although I was a bit dubious of this at first, there’s nothing quite as satisfying as making your way to the top of a Cyclops and plunging a sword into its head. For anyone who likes Crafting systems, DD is a dream come true. This useable material scattered around the environment is endless, and you can collect all of it. Everything from plants to kindling for arrows, to shrouds taken from slaughtered zombies. Each town has an inn where you can store items you don’t need at the moment (everything has weight). I’ve only done a bit of crafting, but I’ve seen the list of items you can create on the wiki, and it’s huge. There are nine different classes called “vocations”. You start by choosing one of three basic ones (fighter, mage, strider). As the game progresses, you get the ability to switch vocations for a cost. You can either pick a deeper variation of the basic (Fighter becomes Warrior, Mage becomes Sorcerer, and Strider becomes Ranger), or you can create a hybrid (Assassin, Magick Archer, Mystic Knight). If you want to spend the coin, you can unlock all nine and switch back and forth between them to take advantage of strengths. Although, you only level up each one as long as you are playing it, so in general, some will always be stronger than others. Leveling up gives you Discipline Points (basically, skill points). You don’t level individual skills like strength, dexterity, magic, etc. Instead, these points can be spent on unlocking special attacks and skills for each vocation. Example, I spent 200 points on my Strider early on and unlocked a Three Arrow Volley, which maps to my controller buttons. You can also change vocations, and you’ll still have access to your points that were acquired with your first vocation, if you want to unlock some skills for a different class (but those points will be used up if you switch back to your original vocation). It’s simply a central pool of XP and you can use them on whichever class you want. 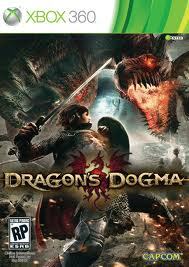 No game is perfect, and Dragon’s Dogma has a few flaws. The graphics seem a bit sub-par, in my opinion, and the voice acting can be a bit stilted at times. Everyone talks in what seems like Olde English a lot of the time, and this definitely creates a bit of cheese factor. And although I haven’t run into this yet, I’ve heard other people say that the lack of any real fast travel system makes moving from place to place seem like a chore. But other than that, the game has been a refreshing spin on the genre. Combat is a lot of fun, and opportunities to obsess over loot stats abound. The pawn system and the boss fights alone should be enough to hook most people who liked either Dragon Age, Dark Souls, or the Elder Scrolls series.